AutoFlo S2020 Steam Humidifier. Steam style 240 volt humidifier. 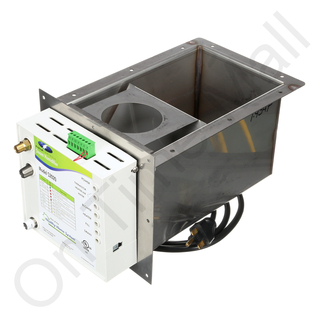 Automatically provides humidity whether the furnace is operating or not. Install in warm or cold air duct. Unit has control transformer, stainless steel reservoir, indicator lights, and automatic water level control with low water shutoff. A remote humidistat activates the heating element to raise the water temperature in the reservoir. When the water reaches 170F the furnace blower turns On, distributing steam throughout the home. Once the humidity level is reached the heat and the blower controls shut off. The computer chip is programmed to enable the heating element to expand and contract so lime deposits flake off and fall to the bottom of the reservoir for easy cleaning. Supplied with template.